Body size affects almost all biological traits, but its influences on defenses, and especially immune systems, are largely unknown. This absence of information is surprising becuase large and small hosts likely experience quite different risks of parasite exposure and quite different consequences of infection. Here we will ask whether body mass affects transcriptomic responses to LPS of various primate species. We are using RNAseq to discern which innate immune genes, gene networks, and/or gene modules are most sensitive to body mass among species of primates. How do small birds cope with acute environmental challenges? Also how quickly can a small passerine, like black-capped chickadees (Poecile atricapillus), change aspects of its physiology (muscle, body composition, etc.) when there is a sudden change in temperature (like a cold snap). This research includes investigating the concept of spare/ultimate capacity and when birds are mismatched phenotypically, i.e. does a cold-acclimated bird respond better to a cold snap than a warm-acclimated bird? Black-capped chickadees are temperate, resident birds that spend their entire annual cycle in one location. That means that these birds must endure harsh winter conditions, like extreme cold and potentially lack of adequate resources. 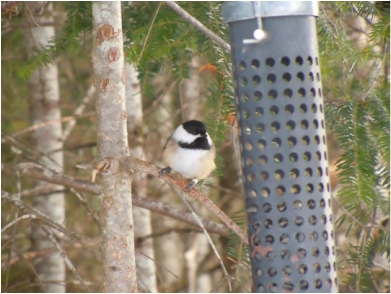 My previous research examined the annual cycle of black-capped chickadees that live in Rimouski, Canada (3 hours northeast of Québec). Specifically, I was interested in how these birds modulate their immune system to cope with the extreme flexibility in weather and forest conditions. I will also be investigating whether or not the use of supplemental feeders and food unpredictability impacts the immune function, metabolic rate and condition of these birds. While most of my project is rooted in ecoimmunology, I am also interested in how the daily energy expenditure (energy budget) might influence the immune dynamics of these birds. Based on the results of our preliminary studies (Cornelius et al. 2017; Cornelius et al. in prep), we are now preparing to expand this research to measure multiple markers of metabolic rate, daily energy expenditure and adaptive immune function in birds given food unpredictability. In classic avian reproduction studies, researchers manipulated parental effort by altering the size of the brood. Many of these studies published results showing that parents with increased "work" often have lower survival and condition; however, nestling condition remains stable. Ultimately these studies investigate the concept of energetic resource limitation on bird physiology, asking whether or not there is a trade-off between workload and health. Although some studies did find signs of a trade-off, recent reviews show that this is often not the case and that parents either reduce investment in their offspring or decrease activity levels to balance their own energy budget (Elliott et al. 2014; Williams & Fowler 2015). Therefore, this aspect of my research investigated the effects that workload has on both parental and nestling condition. To do this I utilized multiple measures of parental effort (field metabolic rate and RFID-based visitation rate) while simultaneously measuring immune response (LPS-challenge, IgY antibodies, complement lysis ability) and body condition in both the parents and the nestlings. At the end of this research I answered the question, "Who pays the bill?" For my master's thesis project, I captured songbirds at a stopover site on the coast in Savannah, GA. I examined the relationship between stress, lipids, parasites and immunity in three species of neotropical migrants during migration. During this project, we examined two questions: (1) whether fat, body condition and stress were indicative of blood parasite infection and (2) whether there were trade-offs occurring between immune measures (WBC counts) and fat or body condition and if WBC count was indicative of infection status. Despite our hypotheses, we did not find that there were any physiological indicators of blood parasite infection and also did not see any trade-offs occurring between immune measures and fat or condition. However, a small subsample of birds that were infected with avian malaria did have elevated WBC counts, which has been shown with other studies in the wild.